If your shower curtain is so dirty that you avoid touching it, it's time to make a major change. Is your shower curtain — or the liner — so nasty you avoid touching it? Do guests mistake the mold for polka dots? Then it’s time to give that bathroom staple a good bath. 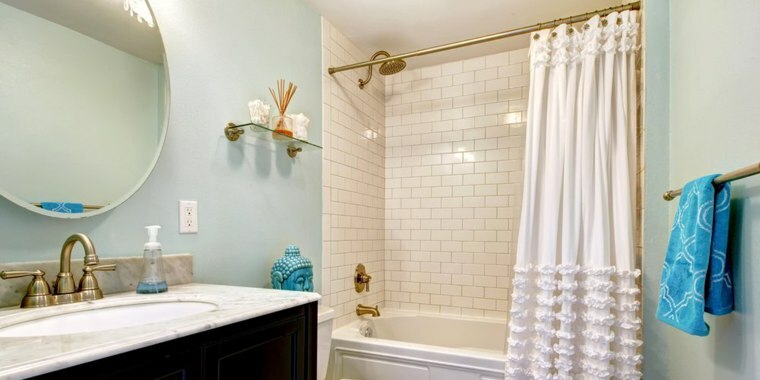 Follow along as handyman Bob Vila shares tips for cleaning the shower curtain and liner. It’s so easy, you’ll wonder why you didn’t do it sooner. Remove the rings, then toss the curtain and the liner in the washing machine along with a couple of white towels. The towels will provide extra scrubbing for better cleaning. Add the regular amount of detergent and ½ to 1 cup of baking soda. Wash in warm or hot water at the highest level. At the rinse cycle, add ½ to 1 cup of distilled white vinegar. Allow fabric curtains to run through the spin cycle, then hang to dry. There's no need to put it in the dryer. Note: If the curtain is plastic, there’s no need to run it through the spin cycle. It’s ready to hang in the bathroom right after it rinses. To remove extra heavy mildew from a white or clear shower curtain/liner, add a cup of bleach to the wash water. For colored curtains/liners, try OxiClean, Clorox 2 or another bleach alternative instead. Basically, every shower curtain is washable, but to be on the safe side, check the instructions on the care tag first. Most bar soaps cause soap scum. Use body wash or a non-soap cleansing bar instead of bar soap. Make it part of your daily routine to spray the shower curtain and liner with a mixture of half water, half white distilled vinegar. To tame the vinegar smell, add a few drops of lemon oil to the mix. There's no need to rinse as it will wash off the next time you shower. Once a week, spray the bottom of the curtain and liner with the vinegar/water mixture then scrub with a brush. This will remove any buildup you might have missed with daily spraying. This article was originally published on TODAY.com on Feb. 17, 2016.